Review: Two short years ago Paddington, Michael Bond’s famous bear in the blue coat and red hat, finally got his first big screen adventure and it was a lovely bit of whimsy that snuck up on me in the best way possible. With its message of kindness filtered through quirky characters and a colorful kaleidoscope of production design, Paddington strangely wasn’t the huge sleeper hit in the US it should have been. Still, enough critics took note of its quality, coupling that with its snazzy UK box office a sequel was greenlit, and boy, are we lucky to have another one of these charming films! The lovable bear (voiced by Ben Whishaw, Skyfall) has settled into life with the Brown family at their comfortable home in London. Mr. Brown (Hugh Bonneville, Breathe) is going through a mid-life crisis, dying his hair and exploring new yoga poses while Mrs. Brown’s (Sally Hawkins, The Shape of Water) attention is focused on swimming to France. Their children, Judy and Jonathan, are both preoccupied with their own teenage interests while their housekeeper Mrs. Bird (Julie Walters, Brave) keeps the house running and everyone fed. A popular fixture on their winding street that has a way of bringing sunshine to all he encounters (save for stodgy Mr. Curry of the neighborhood patrol), Paddington is living his best life, even if he occasionally gets into a spot of trouble. In this outing, Paddington’s Aunt Lucy (voiced by Imelda Staunton, Maleficent) is still back in darkest Peru and he wants to get something special for her in celebration of her 100th birthday. Though at one time she planned to visit London with her late husband, they never made the trip but her adopted nephew finds the perfect gift in an expensive hand-made pop-up book of the sights of city in the curiosity shop owned by Mr. Gruber (Jim Broadbent, The Legend of Tarzan). While visiting the opening night of a dazzling ‘steam circus’ with the Browns, Paddington mentions the book to Phoenix Buchanan (Hugh Grant, Cloud Atlas), a washed up actor that happens to be the descendant of a magician who was desperate to acquire the same pop-up tome. Evidently, contained on its pages are clues to finding a wealth of jewels hidden away by the proprietor of the circus. When the book is stolen and Paddington is jailed for the crime, he has to find a way to clear his name before Phoenix can acquire the bounty. Returning director Paul King doesn’t yield to the episodic nature of Bond’s original creations. This is a bear and family that have adventures and Paddington 2 hits the ground running, barely leaving any time to catch your breath. Bounding joyously through scenes that find Paddington bungling a job at a barber shop to his revolutionizing the lives of his fellow inmates by educating the gruff cook (Brendan Gleeson, In the Heart of the Sea) on the tastiness of orange marmalade, the movie will leave you smiling. It’s so focused on celebrating the innate goodness in people and kindly revealing how unfortunate it is to be someone who can’t find the fun in life, I can’t pick out anything that felt like a misstep. It’s also a legitimately funny and ultimately moving (bring a tissue or two) bit of family entertainment, something of a rarity these days. While both films earn a strong recommendation, I’d give the edge to this sequel, if only for the fact that the first one dealt with a bit more intense villain (Nicole Kidman’s sinewy meanie wanted to stuff Paddington!) and Grant’s character is just a sad song and dance man that wants money to finance a West End revue. On that note, make sure to stay through the credits for an incredibly pleasing musical production number featuring Grant tap-dancing to Stephen Sondheim. Nominated for three BAFTA awards (take that, The Post!) the good news is that there’s already a Paddington 3 in the works, let’s hope nothing gets in the way of its release within the next two years. While we’re at it, this would make a great series for Netflix…just a thought. Synopsis: The inspiring true love story of Robin and Diana Cavendish, an adventurous couple who refuse to give up in the face of a devastating disease. Review: If Breathe seems a bit familiar to you, it’s probably because you’ve also seen The Theory of Everything. That film, about the life of Stephen Hawking, has similar themes and won star Eddie Redmayne an Oscar for his miraculous portrayal of a man whose body is failing him with a mind still sharp as a tack. I found that movie to be filled with good performances (co-star Felicty Jones was also Oscar-nominated for Hawking’s strong-willed wife) but lacking in overall emotional heft. While Breathe was always bound to draw comparisons, the surprising news is that it has the same memorable performances and the resonance The Theory of Everything lacked. Robin Cavendish (Andrew Garfield, The Amazing Spider-Man) is a newlywed living with his pregnant wife Diana (Claire Foy) who contracts polio before he has turned 30. Paralyzed from the neck down and given mere months to live, Robin is resigned to his fate and unable to even look at his infant son. Not content with letting her husband fade away without a fight, Diana becomes his advocate and helps him leave the hospital ward and into their house in the English countryside. Over the next several decades Robin will defy all expectations for those with his same affliction and become a rare voice for patients with conditions that left them unable to move or enjoy the world like everyone else. With advancements in technology that Robin played a part in helping to design, he is able to live a full life as a husband and a father. There are setbacks along the way and painful realties that have to be dealt with, instances that the film doesn’t totally gloss over but does treat them as speed bumps instead of potholes. 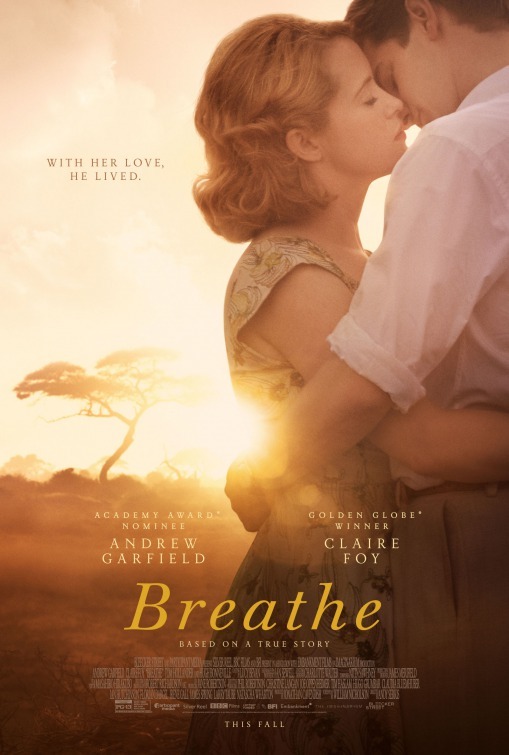 The first film directed by actor and famed motion-capture performer Andy Serkis (Star Wars: The Force Awakens), Breathe looks wonderful and has grand performances as well. Garfield is charming throughout, even when he’s at his depressive worst, and he’s balanced nicely by Foy’s stalwart acting that maintains the dignity in both her character and Garfield’s. It would be easy to let Breathe slip through your grasp and if you happen to miss it in theaters keep your eyes, ears, and heat open for it to pop up for home consumption. Review: I wouldn’t hold it against you if you took one look at the above poster for Paddington and wanted to run for the exit – with it’s on the nose tagline and been-there-seen-that antics you may write off this big screen adaptation of Michael Bond’s beloved literary bear as a kids-only affair. That would be a mistake. My history with Paddington goes way back to a local theater company in Minnesota. My first theatrical experience was seeing a stage production of Paddington at the Children’s Theater Company and ever since then I’ve had an overwhelming fondness for the bear from darkest Peru that arrives in London looking for a family that will take him in. As lovable as that other popular children’s bear, Winnie-The-Pooh, but faced with bigger city adventures, Paddington was a true bear of the world. 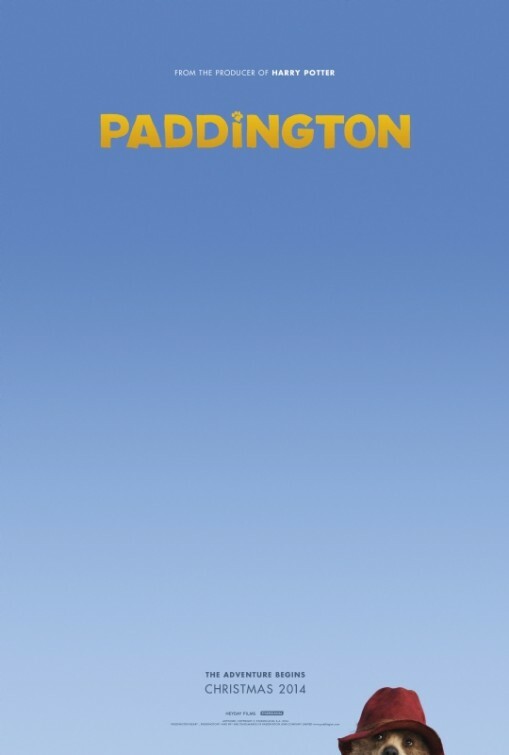 As this is (surprisingly) Paddington’s big-screen debut, we’re treated to a streamlined origin story that shows how our hero moves from living the wilds of Peru with his aunt and uncle (Imelda Staunton, Maleficent, and Michael Gambon) to modern day London where he’s taken in by the Brown family. When his arrival catches the eye of a sinister taxidermist (Nicole Kidman, Stoker), it’s up to Paddington and the Browns to outwit her and avoid getting stuffed. Had Paddington been an American production, this whole set-up might have played like the also-ran story it is. Under the helm of a British team, however, the movie is positively charming from its spirited performances to a colorfully gorgeous (not gaudy) production design. Populated with richly strong primary colors that ground the movie in a kind of whimsical reality instead of the pure fantasy it actually is, there’s interesting detail around every corner. Director Peter King keeps things moving at a brisk pace, never letting the 94 minutes feel slack. True, that does mean some slight overuse of slapstick humor but it’s a good natured fun that’s well-mannered and veddy veddy British. Though originally voiced by Colin Firth, the voice of Paddington comes courtesy of Ben Whishaw (Skyfall) and it’s easy to see why Firth and the filmmakers parted ways. Firth’s voice was perhaps too mature for the impish bear and Whishaw gives him a youth that rings true. Hugh Bonneville (The Monuments Men) and Sally Hawkins (Blue Jasmine) are nicely paired as the head of the Brown family. She’s a free spirit and he’s a button-ed down businessman overly protective of their two children which leads to a nice subplot about the Browns that blends nicely with Paddington’s tale. Even saddled with a platinum bob that appears to have gone through several iterations during filmmaking, Kidman is razor sharp as the villainess of the picture. Even when she’s popping up in slight films, Kidman keeps things interesting so while her role may veer to the “too scary for young kids” side (you decide if you want to explain taxidermy to your youngins) she’s a statuesque ice queen that’s nicely menacing. 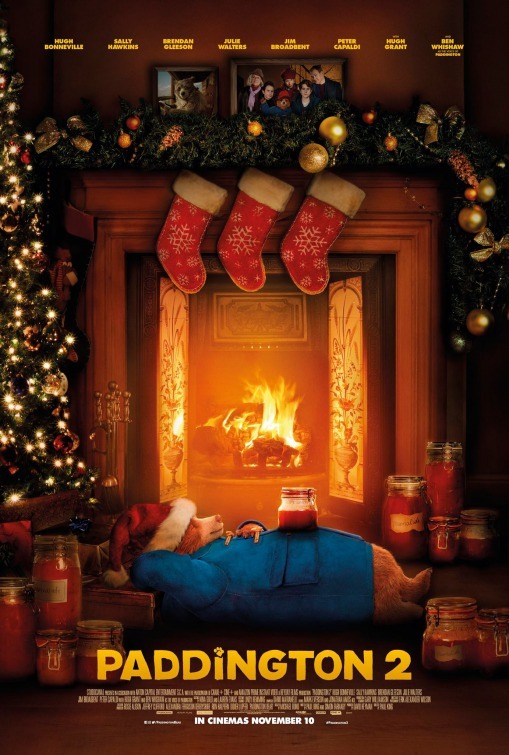 A true unexpected delight, it’s a shame the film wasn’t released in its original Christmas slot to attract the kind of family crowds it deserves but it was quite a busy time for holiday releases. The humor may not be crass enough to keep U.S. audiences used to fart jokes appeased but I was downright charmed by the movie. It’s sweet, quite funny, and exceedingly well made…did I mention the visual effects deserve a round of applause? Paddington has taken a long time to get from Peru to movie screens…and the journey was worth the wait. Synopsis: PADDINGTON follows the comic misadventures of a young Peruvian bear with a passion for all things British, who travels to London in search of a home. Thoughts: It seems a true miracle that it has taken so long for literature’s favorite bear to make his big screen debut. Arriving in 1958 and appearing in 20 books and several animated TV series, the bear from darkest Peru will be popping up for a Christmas-timed origin story. Voiced by Colin Firth (), I’m hoping that Paddington keeps its British sensibilities firmly in tact because that happens to be what has drawn me to the books over the years. I’d hate to see the polite bear of my youth be upended/updated to attract modern audiences. 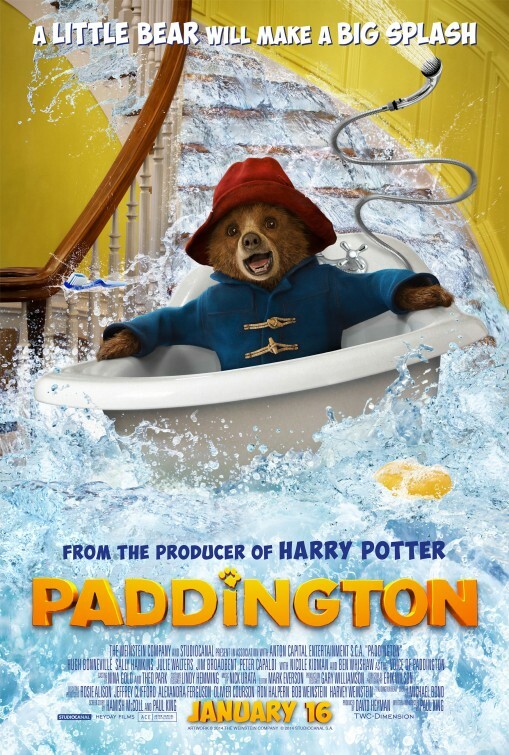 In addition to Firth, Nicole Kidman (Stoker), Hugh Bonneville (The Monuments Men), Sally Hawkins (Blue Jasmine), Julie Walters (Billy Elliot), and Jim Broadbent (Closed Circuit) will all be on hand to usher in Paddington’s first trip to the cinema. Synopsis: An unlikely World War II platoon are tasked to rescue art masterpieces from Nazi thieves and return them to their owners. Review: Though I was engaged for much of the two hour running time of The Monuments Men, while George Clooney and company were romping over Europe tracking down stolen art from the Nazis I couldn’t help but find my mind wandering to a movie playing in the theater next door. While many a critic went goo-goo-ga-ga over the 70’s set heist drama American Hustle I remain an unmoved viewer. Moreover, The Monuments Men represents the film that American Hustle should have been…capitalizing not only on its cast but an interesting plot to keep audiences busy. That’s not to say The Monuments Men is a model of perfection because its flaws are evident to the naked eye…but they’re somehow easier for me to forgive. This is thanks in no small part to star/screenwriter/director Clooney (Gravity, The Descendants) and his great fortune in assembling a cast of talented character actors, and the resulting movie is a mostly satisfying experience. 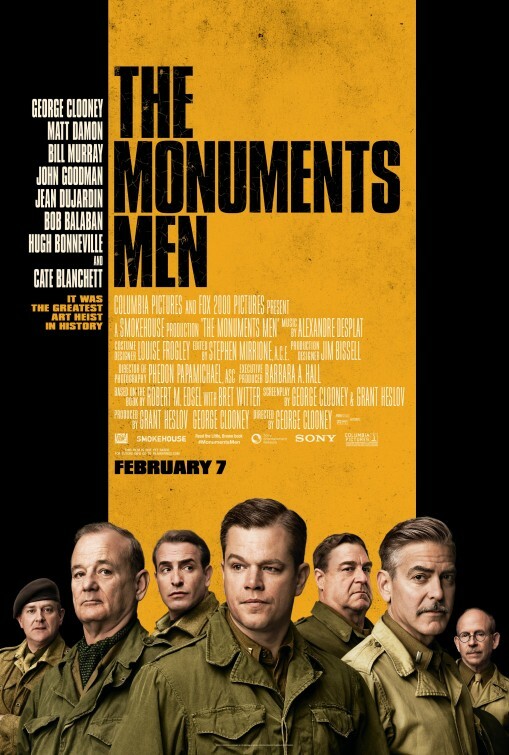 Based on the true story of a special task platoon appointed by President Roosevelt in the middle of World War II, the museum curators and art historians that make up The Monuments Men set out to locate and protect famous works of art from falling into the hands of the Nazis. While this set-up makes it sound like the movie could have been titled Raiders of the Lost Art, Clooney adapts the novel by Robert M. Edsel and Bret Witter into less of a National Treasure-esque globe hopping adventure and more of a wartime drama laced with Clooney’s trademark caustic comedy. Trouble is, for a film that’s linear in shape it’s curiously disjointed in execution with large lapses of time happening in the blink of an eye. If you’re someone that can’t sit through a two hour movie without popping out to use the restroom beware…you may return to a film that’s jumped ahead a significant amount of time. Even though I was following the film closely these leaps threw me for a loop and it became increasingly difficult to track where we were. Perhaps the star wattage (and schedules) of the cast wound up demanding this but it’s also strange that so many of the A-listers spend such precious little screen time with each other. 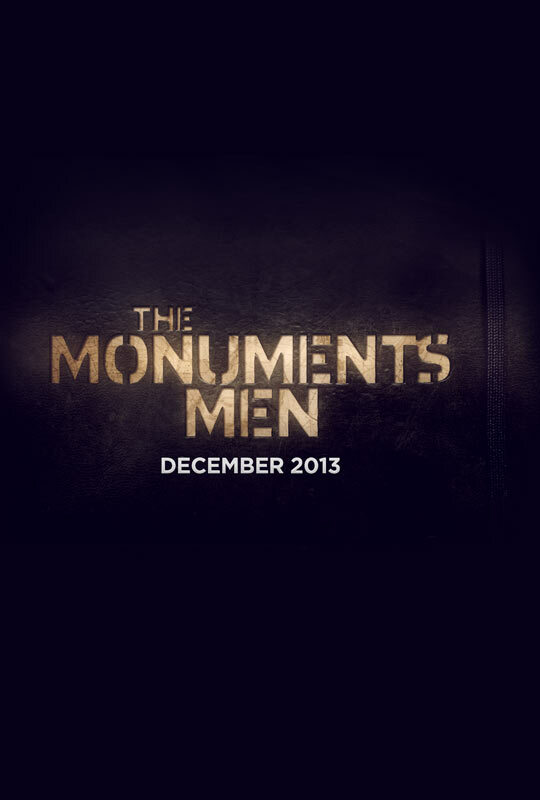 Clooney and co-screenwriter Grant Heslov send The Monuments Men off in pairs which may provide actors like Bill Murray (Hyde Park on Hudson), Bob Balaban (Altered States), and John Goodman (Argo, Flight, Stella) the breathing room to find their rhythm but it robs the audience of the nifty sparks that fly the few times the gang is all together. Timelines and screentime aside, Clooney continues to demonstrate that he’s a movie star for the ages and a snazzy director to boot. By working with 2013 Oscar-nominated cinematographer Phedon Papamichael (Nebraska) and composer Alexandre Desplat (also Oscar-nominated this year for Philomena) he’s able to create a fine period production that looks great and is scored in tune with the film’s narrative turns. Some viewers may be put off by how episodic the film is and in truth this is one of the rare times I left a screening wishing it were significantly longer. This would have allowed more time for affable Matt Damon (Elysium) and tightly-wound Cate Blanchett (Blue Jasmine) to flesh out their characters more…as it is they feel uncomfortably shoe-horned into the proceedings. I find that the best kinds of ensemble films with overlapping storylines are the ones where you’re pleasantly surprised when one arc leads to another…with The Monuments Men you find yourself saying “Oh, I forgot about them”…not good. Clooney’s a good sport as both actor and director — even casting Jean Dujardin (The Wolf of Wall Street, The Artist), the man he lost the Best Actor Oscar to back in 2012. Though the film visits the well of Schmaltzy Big Speech one too many times, I can’t fault the film for being more pleasing than informative, more goofy than learned, and less memorable than monumental. It’s worth seeing, but do know its overall impact is fleeting. Synopsis: In a race against time, a crew of art historians and museum curators unite to recover renowned works of art stolen by Nazis before Hitler destroys them. Thoughts: After scoring so well as the producer of the sleeper underdog of 2012 (Argo), George Clooney now has two movies in the latter half of 2013 to get excited about. Up first is October’s outer-space thriller Gravity where Clooney will take a secondary seat next to Sandra Bullock but it’s in December that he’ll take center stage in front of and behind the camera for this adaptation of Robert Edsel’s true life historical novel. Clooney has a knack for assembling high star wattage for his work and he’s rounded up his usual suspects who have already done quite well for themselves this year (Matt Damon, Elysium and Cate Blanchett, Blue Jasmine). You can always count on Clooney to deliver something topical, well-made, and slyly humorous that can make even a film about saving historical artifacts from the hands of the Nazi’s an edge of your seat event.